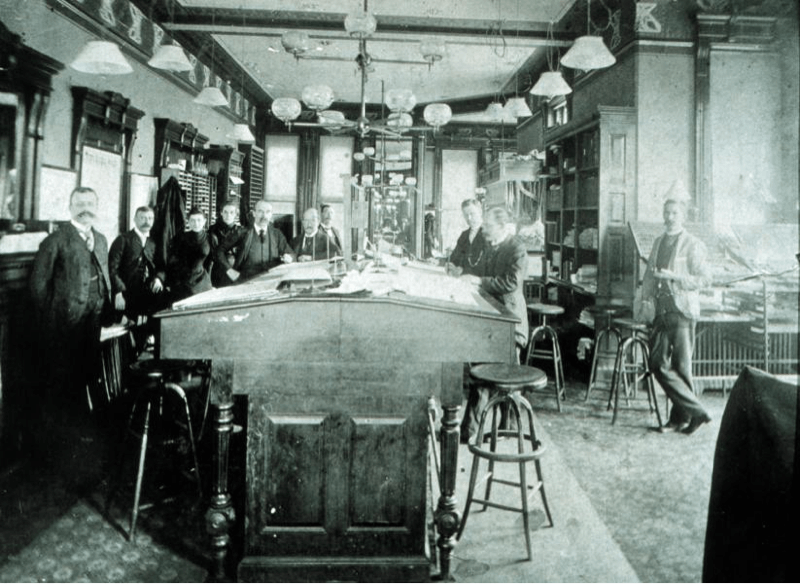 The Weather Bureau, now known as the National Weather Service, was established on February 9, 1870 by the 41st United States Congress and signed by President Ulysses S. Grant. On March 29, 1870, the new weather forecasting service was officially assigned to the U.S. Army Signal Service within the Department of War and given the name The Division of Telegrams and Reports for the Benefit of Commerce. 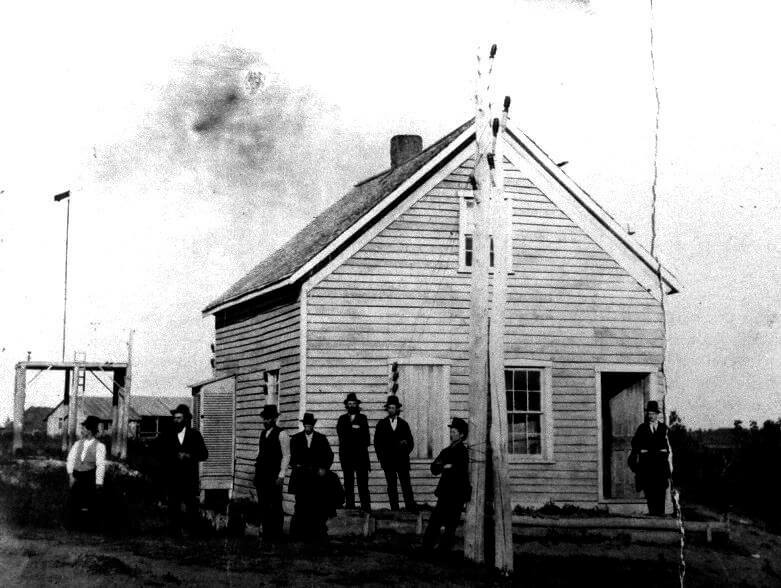 The very first meteorological reports were taken at 24 stations at 7:35 am on November 1, 1870 and successfully transmitted by telegraph to the Signal Service central office in Washington, D.C.
For 20 years, the weather agency operated as a meteorological division of the Signal Service. However, President Benjamin Harrison recommended that the agency be transferred from the War Department to the Department of Agriculture. After consideration by Congress, the act was passed and subsequently signed into law by President Harrison on October 1, 1890. 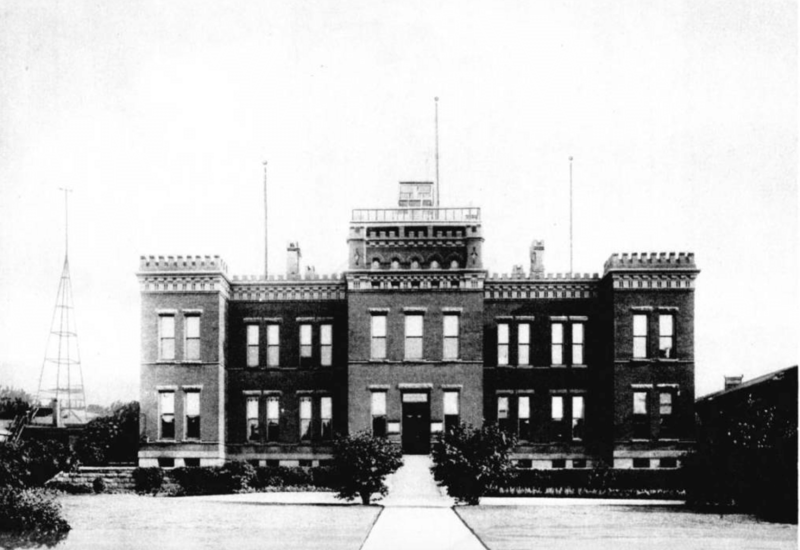 The transfer went into effect on July 1, 1891. On that day, the agency was changed from a military service to a civilian service, and all of the meteorological, telegraphic, and personnel assets were transferred from the Department of War to the Department of Agriculture. The forecasting agency was officially named the United States Weather Bureau. Atmospheric prediction was in its infancy and forecasts were vaguely worded, typically covering a large area for a mere 24-hour period. 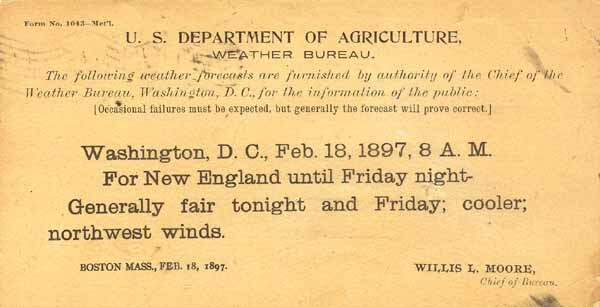 In 1870, a forecast typically sounded something like this, “Through tomorrow, probably fair with a fresh breeze,” a stark contrast to the 7 to 10 day forecasts of 2015. 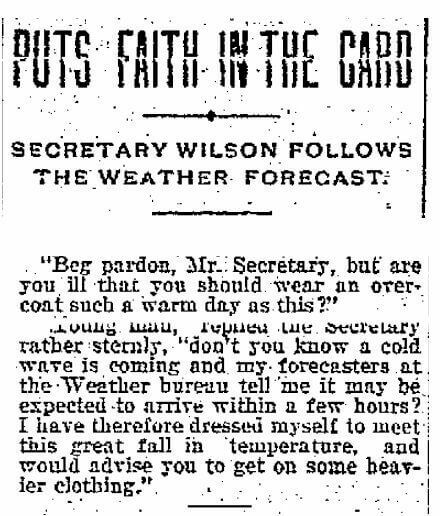 Clearly, the establishment of a weather forecasting agency 145 years ago required enormous faith in the emerging science of meteorology and its potential for significant advancement in the years to come. 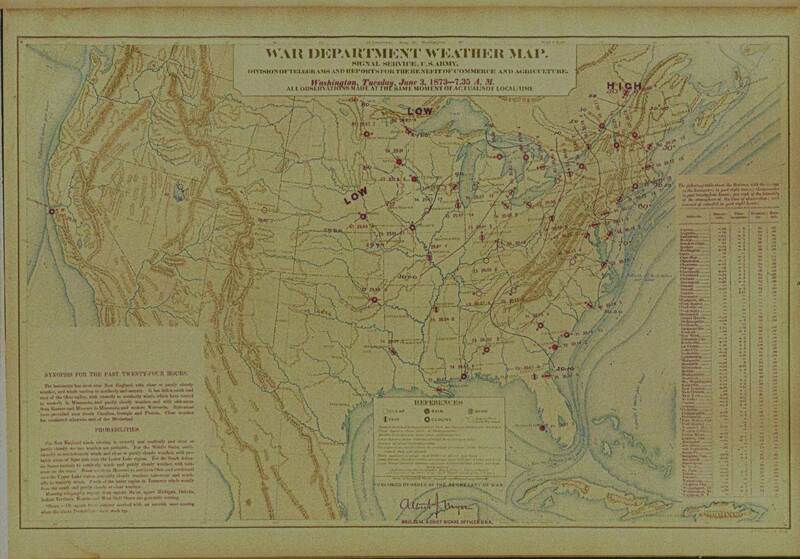 The following image shows a weather forecast published in 1879 by the War Department in a document called the Farmers’ Bulletin. 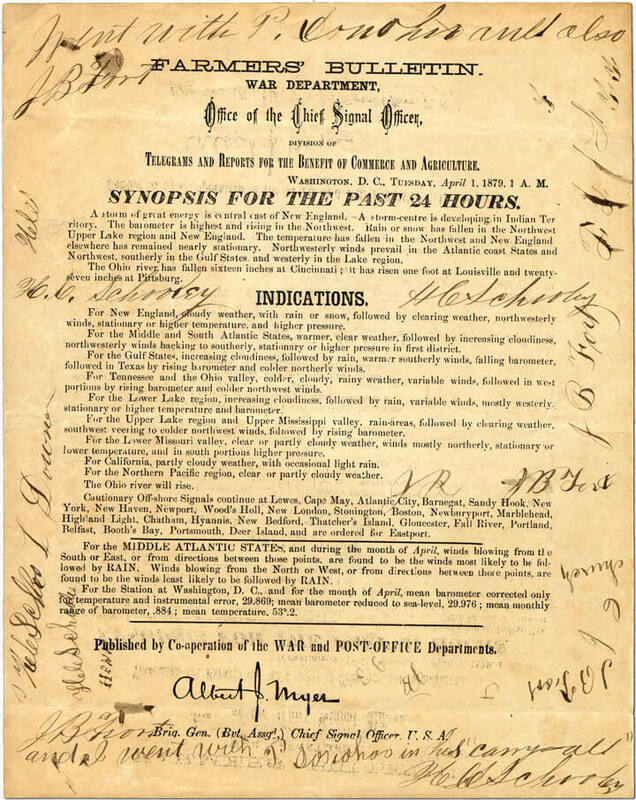 Note that the phrase “Weather Bureau” doesn’t appear in the publication letterhead since the name wasn’t officially used until 1891. Weather forecasters in the 19th Century didn’t have computers, satellites, radar, or numerical prediction models. They relied solely on basic observations such as temperature, pressure, sky conditions, and experience. Without a sufficient understanding of atmospheric fluid dynamics and thermodynamics, their forecasts were short-term, vague, lacked technical detail, and were frequently inaccurate. Yet, the emerging profession was highly regarded. In 1901, the founder of the Weather Bureau, Cleveland Abbe, proposed that the evolution and motion of the atmosphere is governed by the principles and extremely complex equations that apply to the motion of fluids and gases. In 1904, Norwegian physicist and meteorologist Vilhelm Bjerknes took Abbe’s theory one-step further by proposing that the laws of fluid motion and thermodynamics could be used for predicting the atmosphere’s behavior and the resulting weather. The study of fluid motion is known as fluid dynamics, and any modern-day meteorologist will tell you how grueling the meteorology curriculum is, thanks to the rigorous coursework in atmospheric physics, fluid dynamics, and thermodynamics. In 1910, British scientist Lewis Fry Richardson made a valiant effort to tackle Bjerknes’ technique for numerical weather prediction. He did this by hand, and attempted to forecast the change in surface pressure over a 6-hour time period at a single location. Astoundingly, his hand calculations took at least 6 weeks and the prediction failed miserably. He concluded that the process of solving the complex equations of fluid motion and thermodynamics by hand was so tedious that it would require approximately “64,000 (human) computers” continuously calculating, just to keep up with the weather. It’s worth noting that Richardson’s “64,000 (human) computers” calculation has been called into question over the past few decades. Lynch (1993) provides a brief explanation of Richardson’s computational errors. Lynch concluded that Richardson would have needed 204,800 people, not 64,000 (this adjusts only for Richardson’s mathematical error, while preserving his methodology). Ultimately, further efforts in numerical weather prediction came to a standstill, until the invention of the first electronic computer in 1946 (called the ENIAC or Electronic Numerical Integrator And Computer). In April of 1950, a group of meteorologists at New Jersey’s Institute for Advanced Study successfully produced the first weather forecast using the ENIAC and numerical prediction techniques. Although their first forecast was only for a 24-hour period, and the computer calculations took more than 24 hours to complete, their results were successful and marked the beginning of numerical weather prediction as we know it. As we’ve seen throughout this brief historical review, the atmosphere is a fluid that is governed by the equations of fluid motion, physics, and thermodynamics. The equations are so complex that supercomputers are required to solve them, for each grid point in three dimensions (horizontally and vertically); the higher the resolution (i.e., the closer the data points are), the more accurate the NWP models can become. Over the past 30 years, we’ve seen enormous advancements in atmospheric modeling techniques as a result of improved resolution, improved data sources (including satellite data), and improved physics/parameterizations (for example, mesoscale processes, ocean-atmosphere coupling, precipitation/ice microphysics, soil type/conditions, vegetation type/density, topography, and various heat/moisture fluxes, just to name a few). As the models improved, the required computing power increased dramatically (see the histogram below). Modern-day numerical weather models are run operationally on the NOAA/National Weather Service supercomputers in Maryland. NOAA supercomputers crunch over 200 trillion calculations per second. By October of 2015, the computing power will be increased tenfold, to quadrillions of calculations every second! These upgrades will lead to more timely, accurate, and reliable forecasts. We’ve come a long way since 1870! In 1955, numerical weather prediction models became operational by the United States Weather Bureau. Numerical prediction models continued to evolve and improve in the decades to follow. The following histogram provided by the National Centers for Environmental Prediction (NCEP) illustrates the trends in both computing power and operational model skill. 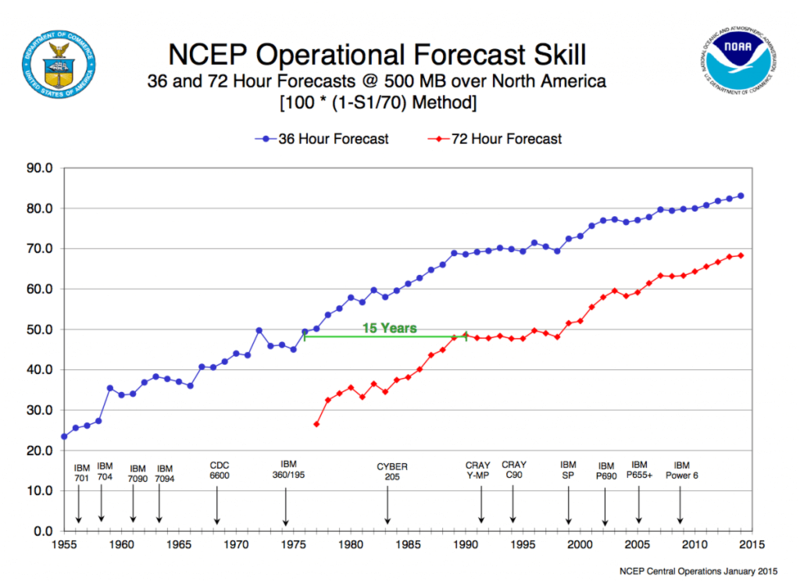 The skill data are for the 36-hour and 72-hour forecasts at the 500-mb level over North America. 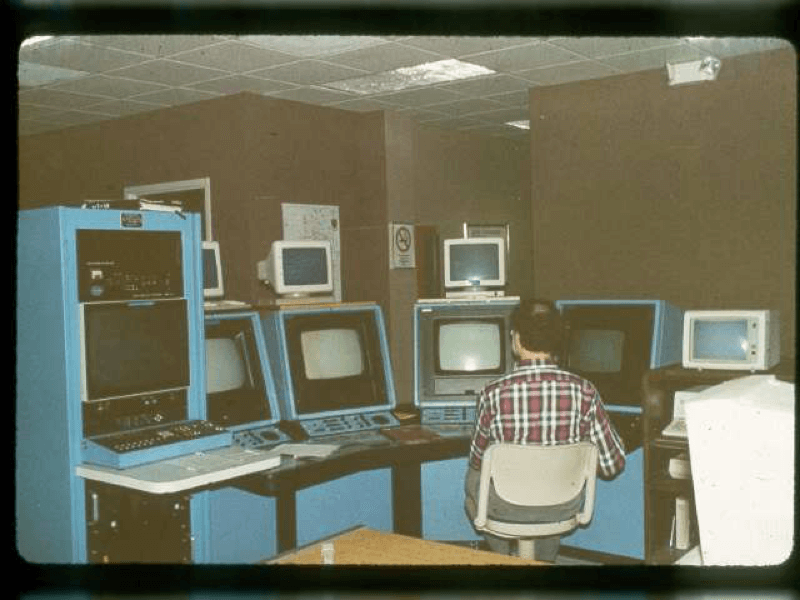 The Weather Bureau became the National Weather Service, an agency of the National Oceanic and Atmospheric Administration (NOAA), in 1970. Here are just a few photos that show the enormous scientific and technological advances over the past 145 years (as of 2015). 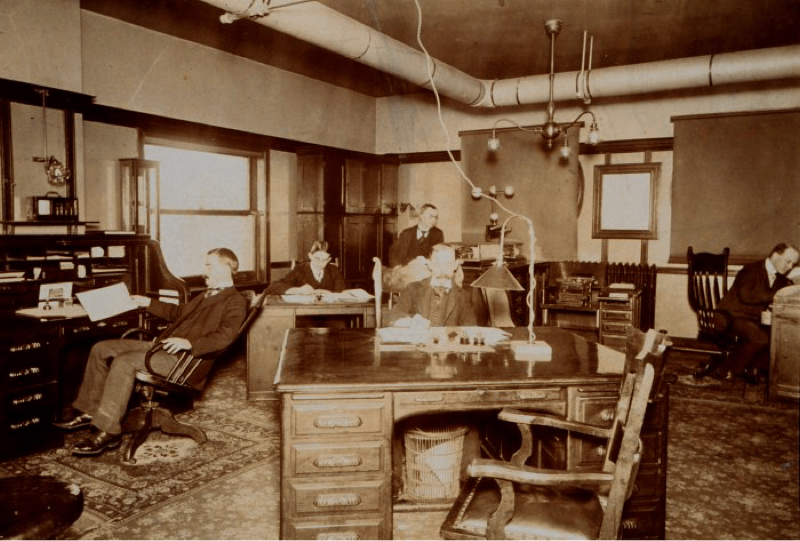 First Weather Bureau Office in Washington, D.C. Photo from 1912. 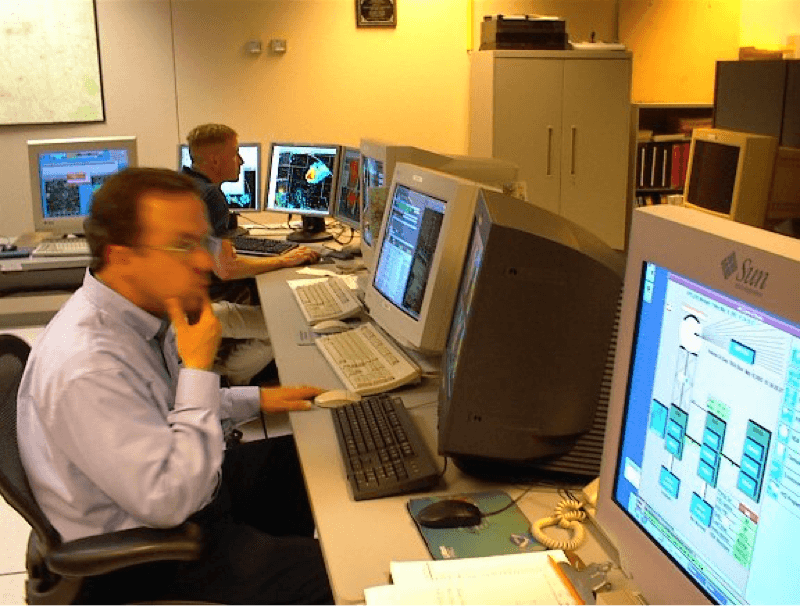 NWS Fort Worth in 2003, with yours truly, Chris Robbins, in the background, working the warning desk. Note: This article is intended as a brief overview of weather forecasting. Although weather prediction has its roots firmly anchored in the countless scientific discoveries over the millennia, meteorology was truly an emerging science in the 19th Century. 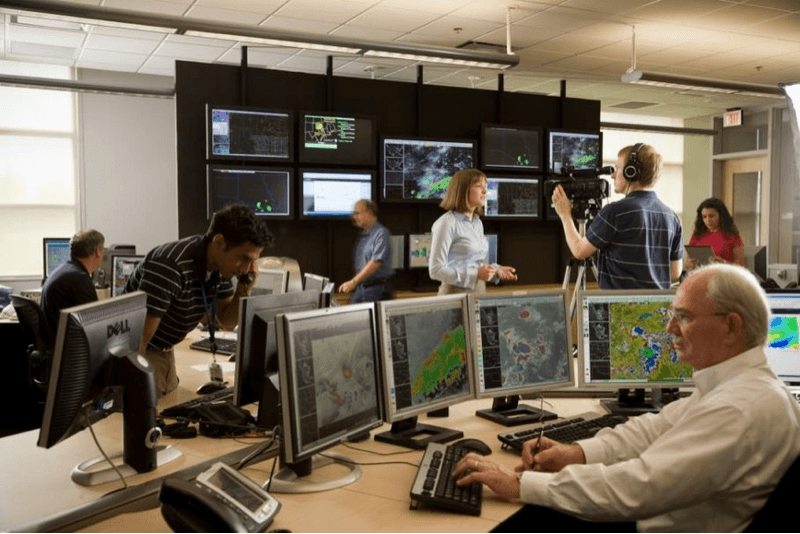 What is the Weather-Ready Nation Initiative?